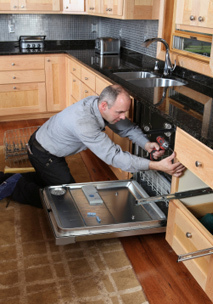 American Home Appliance is your one-stop shop for all your appliance repair, maintenance and installation needs. Serving the Chicagoland area for more than 15 years, the experienced professionals at American Home Appliance understand quality and efficiency. At American Home Appliance, we are certified and licensed to fix any make and model in the industry; even the highest quality brands such as Miele and Sub-Zero. When thinking about our experience and expertise, there is really no brand or model that we can't repair or service. American Home Appliance is consistently training our employees and staying up to date on the latest and greatest technology to ensure the best quality service possible. Customer satisfaction is our number one priority and it's why we have remained successful even in the toughest economic situations. If you're looking for fast, dependable service from a uniformed professional who will treat you like family, call the guys from American Home Appliance. You will be glad you did!